What is couscous? Despite popular belief that couscous is a type of grain, it is actually a pasta. Although it has a rice-like appearance, it is actually made of semolina and wheat flour that is steamed. Couscous is a staple in North African cooking and there are many recipe variations with a host of additional ingredients. It is most popular in the Maghreb, a region of North Africa that includes Tunisia, Algeria, Morocco, and Libya. Fruit, vegetables, and meats are all used as additions in couscous dishes, making it an excellent main or side dish that can please just about any palate. Couscous is not just limited to being a side or main dish, however. It is also used in soups and salads. It can be easily prepared by pouring boiling water over it and allowing the water and steam to hydrate it. It is then fluffed with a fork. You can also boil it like rice, but this method is not the easiest or most recommended because, if you let it cook too long, you can wind up with a mushy consistency which defeats the fluffy texture that couscous is meant to have. Special couscous pots are on the market but can be expensive. They work by steaming the couscous, producing a perfect texture every time. While it is ideal, it's not necessary to have a special pot to prepare couscous. It is one of those kitchen luxuries, like a rice cooker. In grocery stores, you can usually find couscous in the pasta section, the rice section, or sometimes even in the "international foods" area in grocery stores. Even though it is considered an international food, it is widely available and you shouldn't run into any difficulty in finding it, unlike some other Middle Eastern food ingredients. Some box varieties already contain dried fruit and seasoning packets, but it's worth learning to make your own basic couscous recipe and then adding your own favorite ingredients and flavors. The extra effort will be rewarded in taste and a much wider variety of flavor options. You may come across couscous of different sizes. Larger couscous is often labeled as "Israeli couscous" or "pearl couscous". It has more of a nutty flavor and a chewier texture than smaller varieties. Because of its size, Israel couscous does take a little longer to cook than the smaller varieties. Smaller varieties of couscous are typical of what you find in the Maghreb. The texture is more grainy and less nutty than its cousin, Israeli couscous. This type of couscous can be prepared in a matter of minutes because of its small size. Smaller couscous is often referred to as Libyan or Lebanese couscous. In Middle Eastern countries, you can find the boxed couscous, however, it is often handmade—a long process that does take some degree of skill to master. Homemade couscous is as delicious as other homemade pasta, but in general, the couscous found in grocery stores is almost just as good and far more foolproof. If you can make spaghetti, you can make couscous. It's really that simple. Using this basic couscous recipe, allow yourself to become creative and make the recipe your own. Add fruits and vegetables like raisins and carrots or even apples and chicken stock for a creative twist on an old staple. Below you will a sampling of popular couscous recipes and variations, but the list is just a mere fraction of the hundreds and hundreds of couscous recipes that are made. 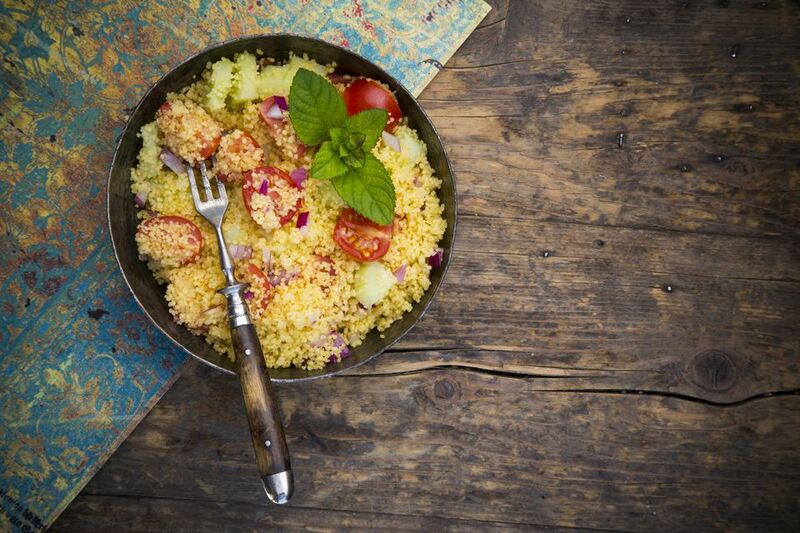 Here are some excellent couscous recipes that are easy to make and satisfyingly delicious. Couscous is kid-friendly and you will find that even the pickiest of children will love it. It's a great food to use to help you sneak in those fruits and veggies that many kids refuse to eat.